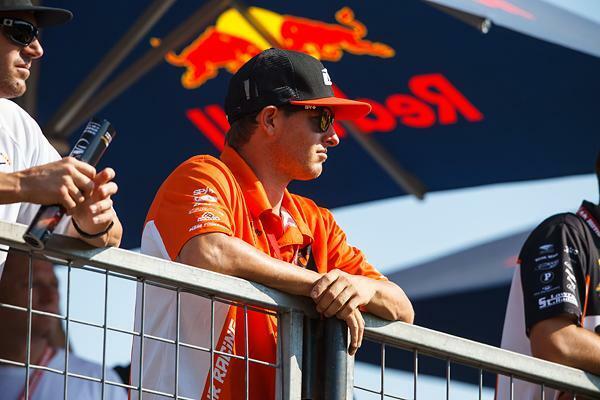 You might not find a busier industry guy than KTM's Michael Sleeter. He's not only the lead test rider for the brand's consumer bikes, he also runs the Orange Brigade Amateur Program, and, at Loretta's, he raced and ended up winning the National Championship in the Two-Stroke Class! That's a lot going on. He talked to us about it for this week's Between the Motos. Racer X: Explain your week here. Obviously you won the Two-Stroke title, but I know you have a lot more going on down here than that. Michael Sleeter: Yeah, three years ago, as my racing R&D time began to wind down, I had the opportunity to move on and take over the KTM amateur program. I took a lot onto my plate, but I want to really accomplish a lot, and really get some winning riders. I feel like we're accomplishing that, but this year KTM also thought it would be good if I raced down here myself. So I've had to move away a bit from the customer support, trackside technical service stuff, and turn into more of a mentor, brand manager, sponsorship guy. But you still work with your riders? As much as I can, you know? Try to be more of a mentor, kind of like what Roger DeCoster gave to Dungey--but at a much smaller level! By no means am I saying I can fill Roger's shoes, but I'd like to be able to give our younger kids support and guidance. It's fun and it's challenging, but most of all, the crew that handles all the technical support stuff, they understand what my role is now and we all work very well together. Sleeter is a jack of all trades for KTM. He tests, runs the amateur program and even races! You've been at KTM for awhile now and it seems like things are changing quickly. Yeah, this will be my ninth year. I started testing with some of the first PDS bikes, and now we have linkages, 250s, 350s and 450s, fuel injection, and I'm really proud now to be part of our SXS line of mini cycles, these are bikes with special things on them and they really perform well. My number one job at KTM still is to test bikes for the consumer, the big bikes, and develop those. So then I take some of the things I learn from the big bikes and transfer that down to our line of 50, 65 and 85s. I want to be one step ahead, and I feel we are with our new 85SXS. And then you see what is happening in our pro racing, with Roger and Dungey and the success they are having, and I just want to stay within their dust! How the heck do you develop and test 85s? Are their kids that really know how to do it? I have two kids, Mitchell and Kiernen, an 11-year-old and a 13-year-old, and we give them stuff, but it's really hard. When they see a box van, and some guys in company shirts, they think you're waving the magic wand over the bike and it will be better every time. But testing is hard, sometimes the changes make things worse, and we need them to be honest with us and tell us if it's going in the wrong direction. We try to take the emotion out of it, for example we'll run old plastic on the new bike. We have to teach them how to do it. The biggest thing is, if you don't like it or you don't notice the change, you're not going to hurt our feelings. We just need them to be honest. So you're literally testing the bikes people buy? Yes, that's my whole focus, developing those bikes. I can say that, until Dungey came along and started testing, I probably had more time on that Factory Edition 450 than anyone else in North America. I got my hands on it the day after des Nations last year and did everything I could to get it ready for Ryan. And you used to test for the race team? I used to do race testing before Roger came on board. He has a different way of doing things, and I think he has a pretty good idea of how to do it based on his results! 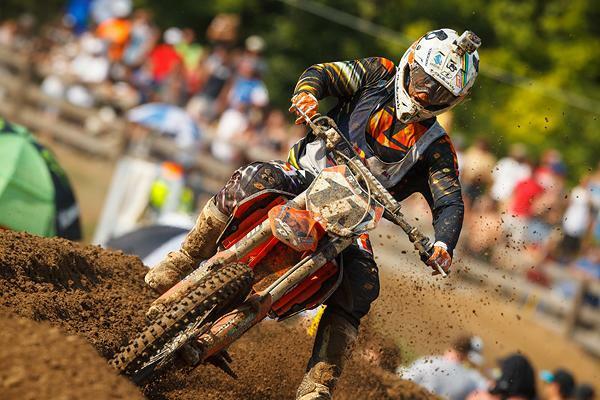 Sleeter finished fourth in the 25+ Class, but took home the Two-Stroke Championship at Loretta Lynn's. So, talk about racing here. Well, the racing hat is gone. I have to focus on my main job, and that's keeping it on two wheels and representing the brand. Yesterday I was in the final moto of the day, 25 Plus, and I got a pretty good start. But I was flat, I was just tired. My fitness is better than it's ever been, but I was working all day doing my job, so I didn't have the right preparation going into that moto. For the two strokes, I had a chance at the title, and everyone was really good to me and let me relax all day, stay cool and hydrated instead of just walking laps around the Ranch for hours and hours. It was cool and I was able to pull out a title for them. How well did you do in your first go around here? I was a late bloomer. I started riding here in 1998 as a B rider, I got sixth, then in '99 I got a third, and in 2000 I got a third in the A class. So I was always kind of in the shadows. It played in my favor because it made me want to work harder and harder, but, from A, I went to supercross too soon. I should have stayed amateur for one more year--and that's the type of advice I can bring to the table for our kids. I got hurt two years in a row trying to race supercross on privateer bikes when I wasn't ready. What's it mean to get a title here? It means a lot. The track is tough, three long motos in the heat. And I had to race a kid who used to ride for me! Ty (Siminoe) is a great kid, but he had to make a decision to help his career and move onto a different deal. But in the two-stroke class, he was on a white and green KTM, and I just couldn't let a white and green KTM win! It was fun to battle him, and I wish him the best of luck in the future. I hope now that I've gone through all this, qualified and ran three solid motos and was able to win, that there will be more advice from that that I can pass down to our kids.